Each day is your own - start off with a lazy lie-in or a family Wake 'n' Shake session, before heading to the indoor pool complex. 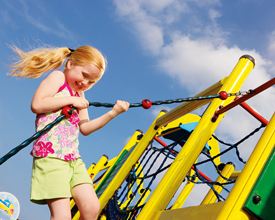 Or have a great adventure on the Climbing Wall with Abseiling and Zip Wire. 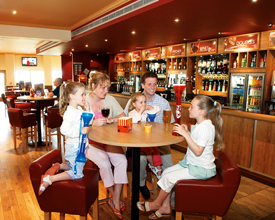 Lunch out at a local pub, or pop into the Mash and Barrel: Lounge-Bar-Cafe, the perfect place to decide how to spend your afternoon - a round of Crazy Golf, or exploring Norfolk, strolling on the beach. 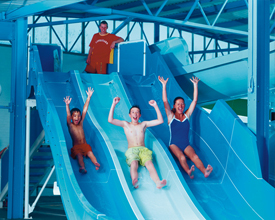 Caister Holiday Park offers the following facilities. 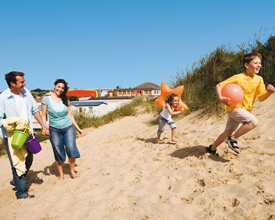 Enjoy the best East Anglia has to offer with trips to the nearby Norfolk Broads or enjoy direct access to dunes and a large sandy beach at our Caister park. Local attractions include the Sea Life Centre containing an underwater tropical reef plus 25 themed displays as well as Britannia Pier with theatre shows. For the adrenaline junkie try a day at Great Yarmouth Races, a versatile leisure venue offers exhilarating Horse Racing from Easter to October and kids go free! Also Pleasurewood Hills Theme Park has thrilling rides and excitement for all the family. Historic sites are plentiful with Norwich, the historic city of Norfolk, with cathedral, shops, and lots to see and do, from plays to concerts, clubs to cinemas. Or try Caister Castle, which also houses the motor museum. Finally no trip here is complete without visiting the Hippodrome Circus, twice voted Britain's best Circus, with spectacular circus productions during the summer and winter seasons, featuring international circus artistes, dancers, swimmers, acrobats and clowns in a unique show. No two families are ever quite the same. That's why we offer you such a wide selection of Holiday Homes with those small but all-important differences - in space, style, number of bedrooms, luxurious "extras", location on the Park, and of course price. 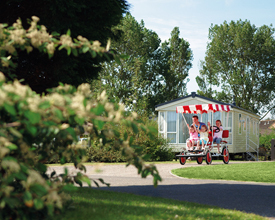 On top of which, we offer adapted caravan-style Holiday Homes with wheelchair access. Our Premium Accommodation range, available at selected Parks, is sure to satisfy those looking for that extra luxury and that 'special holiday' feeling. Our Caravan Holiday Homes provide all you need for relaxing and carefree Self-Catering holidays. There's clever storage, high levels of comfort and all the essentials that you need for a great holiday, our good value Standard range has everything you need, whilst at the top of the range, Prestige offer the ultimate in quality and style. All this plus the freedom to come and go as you please. Our Chalet accommodation remains highly popular, especially with large and extended families. This is Haven's value option. Most are on one level, but some have stairs to bedrooms on an upper level. Adapted Holiday Homes, these are available in a choice of grades, adapted for wheelchair access with ramps, wide sliding doors, converted WC/Shower Room and trapeze lift handles. Having 2 bedrooms and convertible beds in the lounge, they are suitable for family and/or carer accommodation sleeping up to 6. Have you been to Caister Holiday Park? Please submit your review so that others can benefit from your experience. Important note: Information provided here about Caister Holiday Park is based on our best knowledge. However, please check with Caister Holiday Park before booking to ensure that you have the information required. Reviews are the sole views of the contributor and do not necessarily represent the views of CampsitesandCaravanParks.com or Caister Holiday Park.